The world is ringing-in 2019 with good cheer, but the US Strategic Command (STRATCOM) has a different kind of fireworks in mind. On New Year’s Eve, it showed off footage of stealth bombers and big explosions. STRATCOM’s New Year’s greetings come in the form of a 40-second video of the B-2 Spirit bomber in flight. The aircraft deploys two GBU-57s – huge bunker buster bombs known as Massive Ordnance Penetrators – which hit a target on the testing grounds. 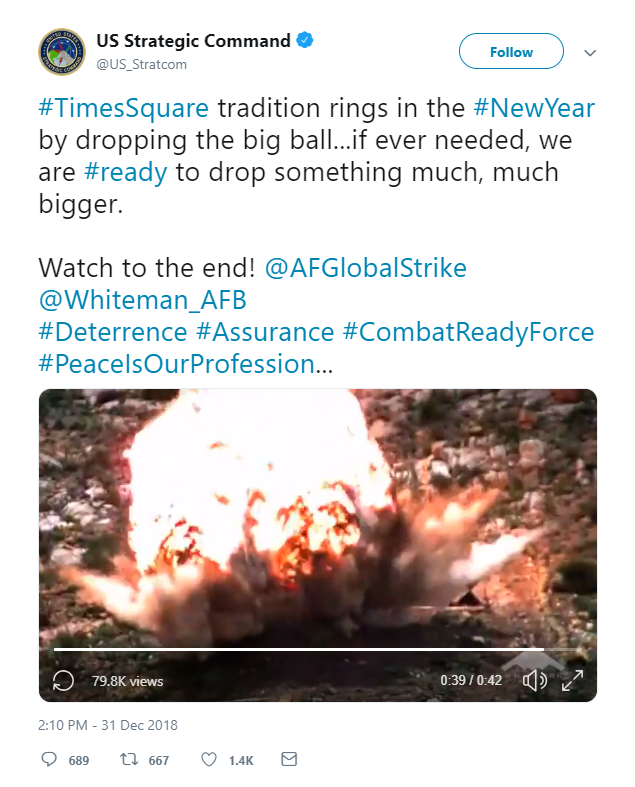 “Times Square tradition rings in the New Year by dropping the big ball… if ever needed, we are #ready to drop something much, much bigger,” STRATCOM tweeted, referring to the traditional celebration in New York City and it’s dropping crystal ball. The bizarre message got almost 2,000 likes and close to 1,000 retweets before it was removed. Just as many people replied – and most of them were not happy, to put it mildly. “Delete this” was a running theme, while some of the current and former military reacted with “Whiskey Tango Foxtrot,”which should be read as an acronym.